Vampire Knight is a Japanese action adventure animated TV series following Yuki Cross and her friend Zero Kiryu, who try to mediate truce between humans and vampires in the Cross Academy. But, nothing as it seems since those who Yuki thought as her allies, turned out to be her worst enemies sworn for life. 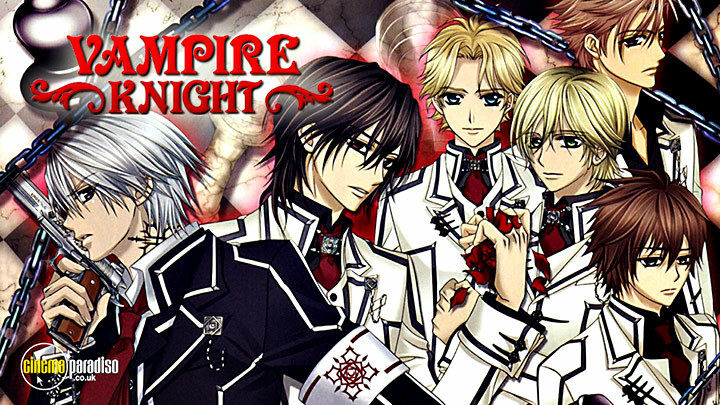 The series Vampire Knight takes audiences to Cross Academy, which is attended by two groups of students: the Day Class and the Night Class. At twilight, when the students of the Day Class return to their dorm, they cross paths with the Night Class on their way to school. Yuki Cross and Zero Kiryu are the Guardians of the school, protecting the Day Class from the Academy's dark secret: the Night Class is full of vampires! Contains episodes 1 - 4. Kaien gives Yuuki a protection bracelet that would stop Zero if he attempts to bite her again. A new ethics teacher, Toga Yagari, joins the school, and in his first class, Zero leaves. In the town, a Level E vampire attacks Yuuki and Zero, and they are saved by Night Class students Takuma Ichijo and Senri Shiki, who explain that they were hunting the Level E as part of their duties as noble-class vampires. Takuma invites Yuuki and Zero to his party, in which Kaname explains to Yuuki the continuing battle between vampires and vampire hunters. Zero, uncomfortable by the presence of so many vampires, leaves. Yuuki follows him and Zero attempts to bite her. Yuuki pulls Zero into a pool, and Yagari, revealing himself as a vampire hunter, shoots Zero in the shoulder. The students at the prestigious Cross Academy live between two worlds - the human Day Class and the vampire Night Class! Human Yuki Cross serves as a Guardian protecting the classes from each other, while her friend Zero has just transferred to the Night Class, doomed to a life of bloodlust as a newborn vampire! After being sent on his first mission as an official vampire hunter, Zero must now face the mysterious appearance of Maria, a new student at the school who looks all too similar to the vampire who turned him! But as Zero starts descending into a terrible madness, Maria offers Yuki a choice - surrender her powerful blood or watch her friend slip into insanity...Can Yuki find a way to save Zero? Find out in the third exciting volume of Vampire Knight! Contains Episodes 8-10. In the twilight world of the Cross Academy, students are split between the human Day Class and the vampire Night Class! Can the human Guardian, Yuki Cross, and her vampire ally, Zero, maintain the balance in this bloody class warfare? Zero's human twin brother Ichiru returns, working in an unholy alliance with Shizuka - the same mad vampire who sired Zero! But when Ichiru threatens Yuki, what sacrifices will Zero make to protect her, and will anyone survive the bloodbath that follows? In the middle of this violent family reunion, secrets of Yuki's and Zero's pasts are revealed - ones that will have untold effects on everyone's futures. Everything changes in the final volume of Vampire Knight! Contains Episodes 11-13. At prestigious Cross Academy, there are two sessions of classes, the Day Class and the Night Class. As the school's Disciplinary Committee, Yuki Cross and Zero Kiryu keep watch over the Day Class students, who are all infatuated with the beautiful, elite Night Class students. As Guardians, Yuki and Zero must also protect the secret of the Night Class - they are all vampires! Zero allows his twin brother, Ichiru to join the Day Class, but Zero is still suspicious that Ichiru wants to enter the academy to take revenge. Yuki continues to hallucinate that her surroundings are drenched in blood, and is determined to ask Kaname about her past. Kaname reveals that he is worried that Yuki will hate him when she learns the truth about her memories. Yuki claims that she could never hate him, and Kaname asks Yuki to become his fiancee to prove her devotion. Contains Episodes 5-7. News has spread quickly and now everyone knows that Yuki is Kaname's sister. Rido looks forward to the awakening of Yuki, who after regaining her memory recalls the famous fatal night perfectly and is now tormented by her feelings for both Kiamame and Zero. Contains Episodes 8-10. Yuki's earliest memory is of a stormy night in winter, wherein she was attacked by a vampire...And then rescued by another. Now 10 years later, Yuki Cross, the adopted daughter of the headmaster of Cross Academy, has grown up and become a guardian of the vampire race, protecting her savior, Kaname, from discovery as he leads a group of vampires at the elite boarding school. Contains Episodes 11-13.